Freemium or Premium? The choice isn't so easy. When you sign up for the free plan inside the new Spotify app, you'll be greeted with a redesigned on-boarding screen that asks you to select your favorite artists. That sets the machine learning algorithm in motion, and you'll instantly be greeted with a playlist of songs you might enjoy. Then, as you listen, like, and hide songs, your invisible curator will become smarter and deliver more personal recommendations every day. Spotify's free tier is way more personal than it was before. This is the big one. Where Spotify's free users previously had access to all the service's playlists, they could only listen to them in shuffle mode. That's changing with the new app. Spotify will now offer 15 playlists a day to its free users—including popular ones like the awesome Rap Caviar mix—with unrestricted listening, meaning you can play the same song 100 times in a row if you'd like. Some of these playlists will be updated daily, others weekly, but Spotify promises more than 750 personalized tracks will be available for on-demand streaming every day. 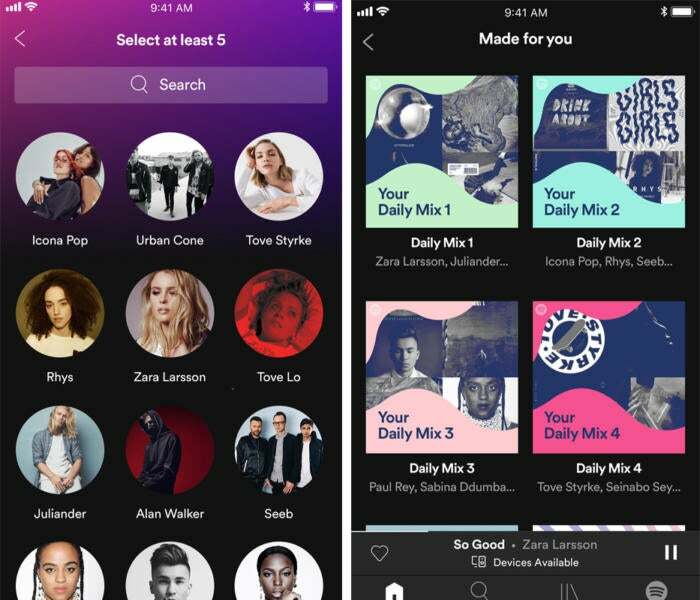 One of the Spotify app's greatest strengths over its competitors has been easy playlist creation on its mobile app. That's not changing with the new version—nor is the shuffle-only restrictions on the free tier—but there is one feature Spotify is bringing over from Premium that might help you make better mixes. 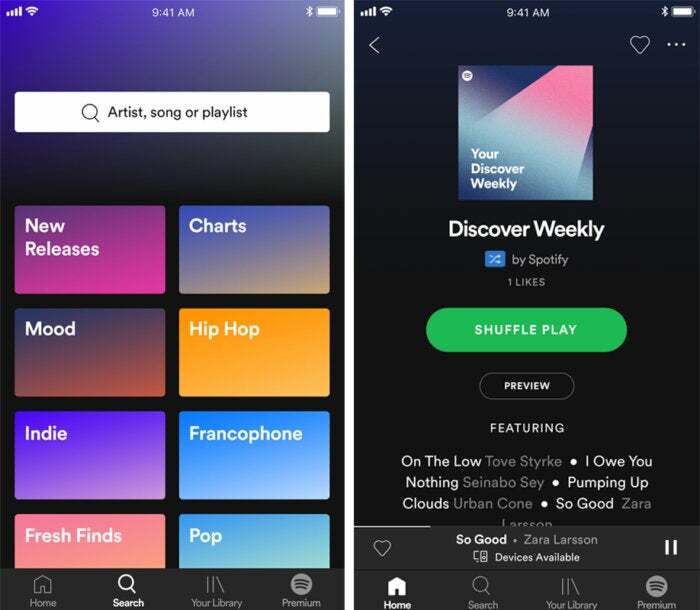 As you curate your playlists, Spotify will continually suggest songs based on your musical tastes, the artists and genres you've picked, and even the name of the playlist itself. And what's more, it'll keep recommending new songs as you listen to it, so your favorite playlists won't get stale. You don't have to be a Premium user to get playlist assistance anymore. With the new app update, Spotify is removing one of the major pain points for its free users, mobile data usage. 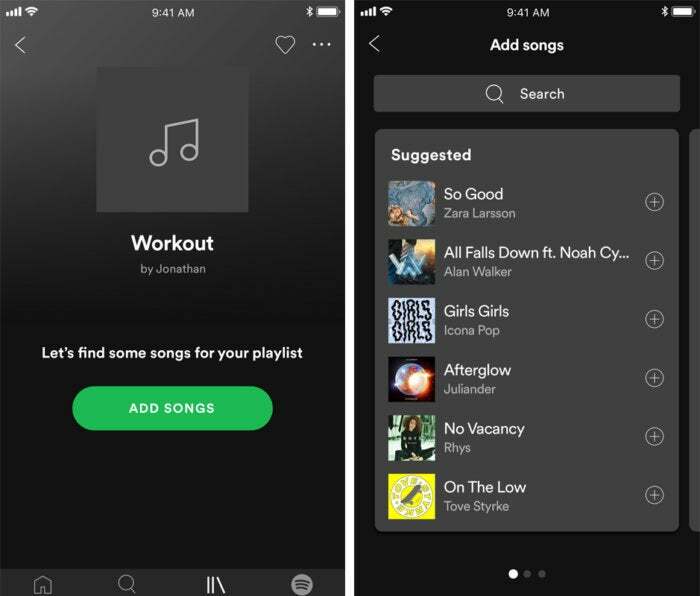 While free users still won't be able to download songs for offline listening, Spotify is introducing a new Data Saver toggle in Settings that will enable automatic caching of your favorite songs and playlists so you won't have to burn through you monthly data allotment while working out at the gym. 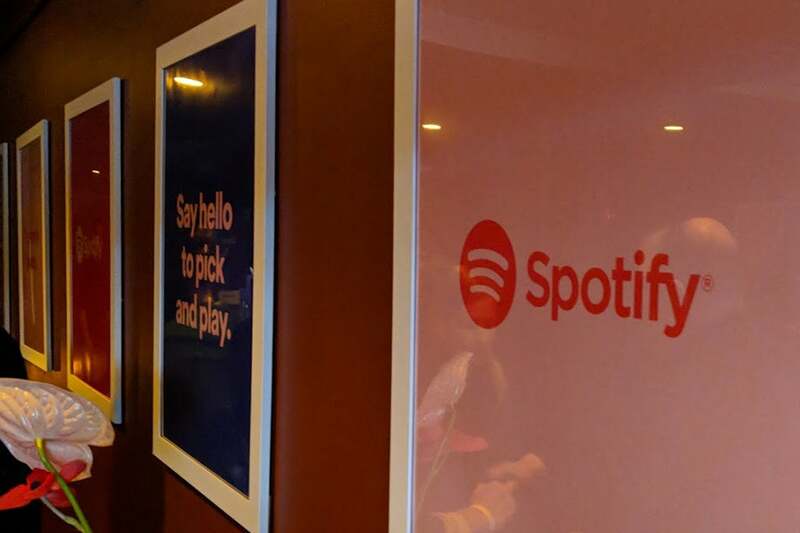 With prompts based on mobile data usage, Spotify estimates this will decrease data usage by as much as 75 percent. One of the first things people will notice when launching the new Spotify app is that the Radio tab is gone. That means you won't be able to quickly jump into a station and start rocking out to J. Cole or Drake, but that doesn't mean you won't get a radio-style listening experience with the free tier. In fact, it's just the opposite. When you hit the Search tab now, you'll be presented with a list of genres to help the service focus on your mood. Then you'll get recommendations of artists, songs, and playlists tailored specifically for your tastes rather than generic radio stations that may or may not fit the bill. From search to playlists, Spotify's radio stations are everywhere now. Obviously, ads are the main reason why people opt to pay Spotify $10 a month, and after today's update, that hasn't changed. If you don't want to hear 15-second ads between songs, stay on the Premium tier. While Spotify is giving its free users on-demand access to hundreds of songs every day, it pales in comparison to the 35-million-song library that Premium users get. Sure, free users can search the entire catalogue, select songs for playlists, and add anything to their library, but only paid subscribers have the ability to play them whenever they like. So if you want to hear J. Cole's "Friends" without waiting for it to appear on one of the free tier's unrestricted playlists, Premium is the only way to go. You can pick and play some songs on the free tier, but only Premium gives you access to all of them. Spotify's new app might have a data-saver mode for on-the-go listening, but nothing beats the ability to download songs right to your device. 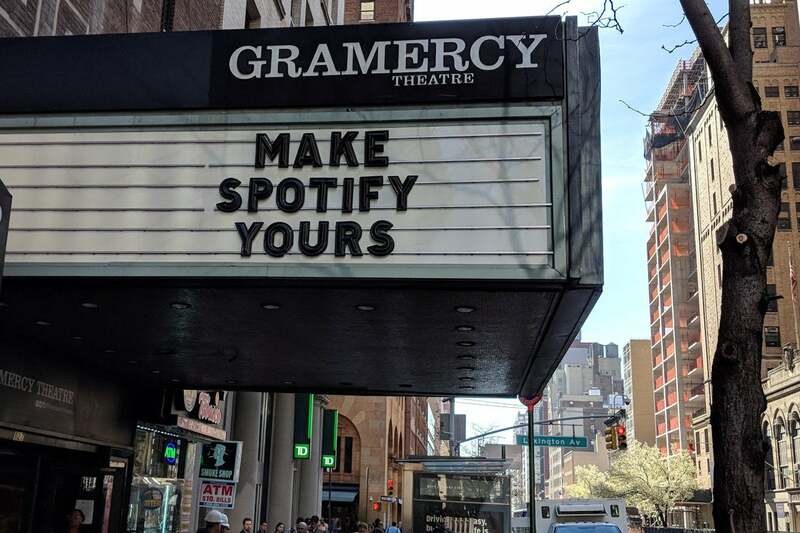 If they have a spotty connection or a dwindling data pool, Spotify's free users may be out of luck, while Premium subscribers can listen for hours and hours without using a single megabyte of LTE data. Spotify didn't announce a speaker or any other hardware at its event, so you'll still need to use a Google Home, Amazon Echo, or Sonos One (sorry HomePod fans), if you want a voice-controlled listening experience at home. But to do that you'll need a Premium subscription. A few weeks ago, Spotify and Hulu announced they were teaming up to offer a one-of-a-kind digital bundle. For $13 a month, you'll get a subscription to Spotify Premium (normally $10 a month) and Hulu's Limited Commercial plan (normally $8 a month). That's a savings of $5 a month or $70 a year, and it lets you choose between streaming Taylor Swift's Reputation or Margaret Atwood's The Handmaid's Tale. If that's not a double-threat, I don't know what is.